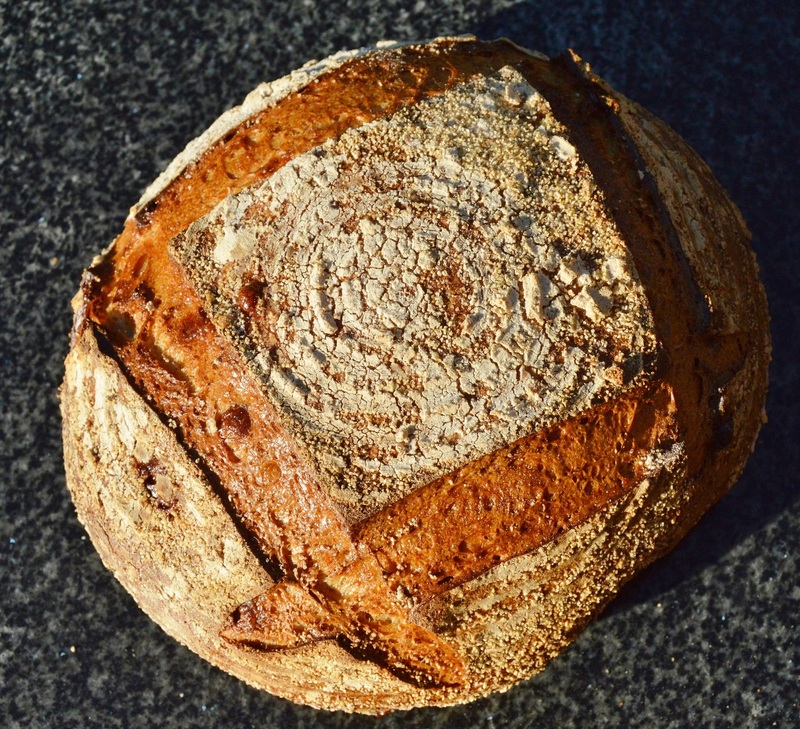 A sourdough boule made from ingredients that are fairly local to me in Surrey, UK. The cheese (Spenwood) is strong and nutty; the ale (Hogs Back Brewery) is so easy to drink! They do not take over from the deep tang of the bread but they are most certainly there as complementary bedfellows! 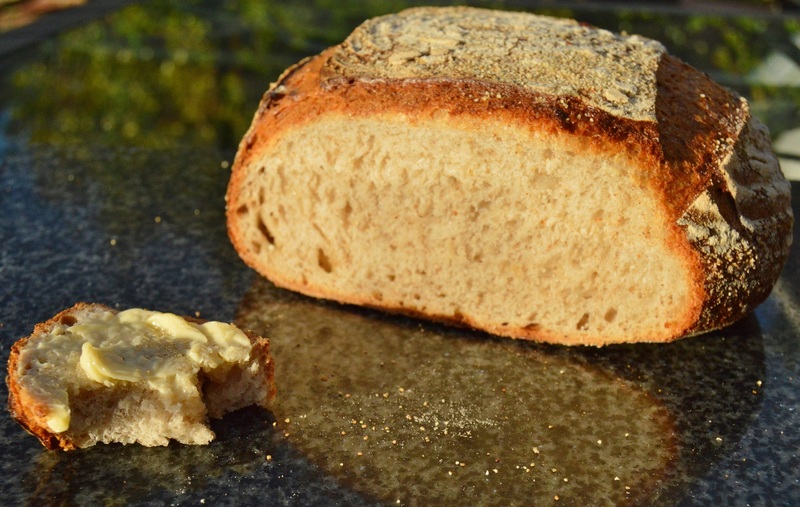 Toasted and buttered, this bread is seriously heavenly; there is certainly no chance of having left-overs! I used my rye starter that I fed the day before with rye flour but any active starter works brilliantly. I normally feed with about 150g flour and 150ml water, stirring well to incorporate before covering. The starter is ready to use in a recipe if a small amount of it dropped into water floats. I went for a lower overall hydration than I would do for an unflavoured sourdough when I first made this but I have increased the ale content with very good results. 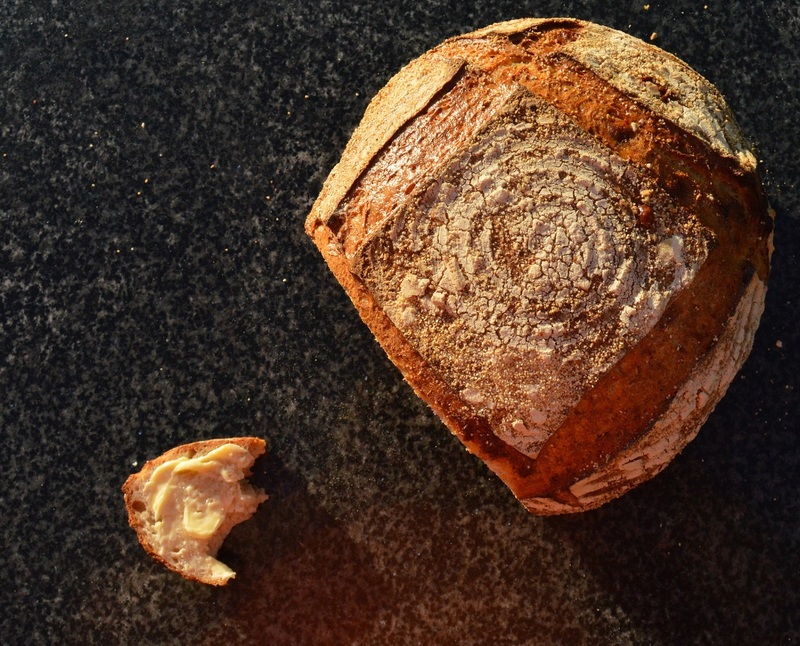 Full detail on sourdough, including how to make a starter, is on my post here. You can make a non-sourdough version using 4g dried yeast instead of the starter, and increasing the flour content to 500g and the ale content to about 340-370ml. However, I urge you to let the bread have its first rise the fridge slowly to develop the flavour significantly. 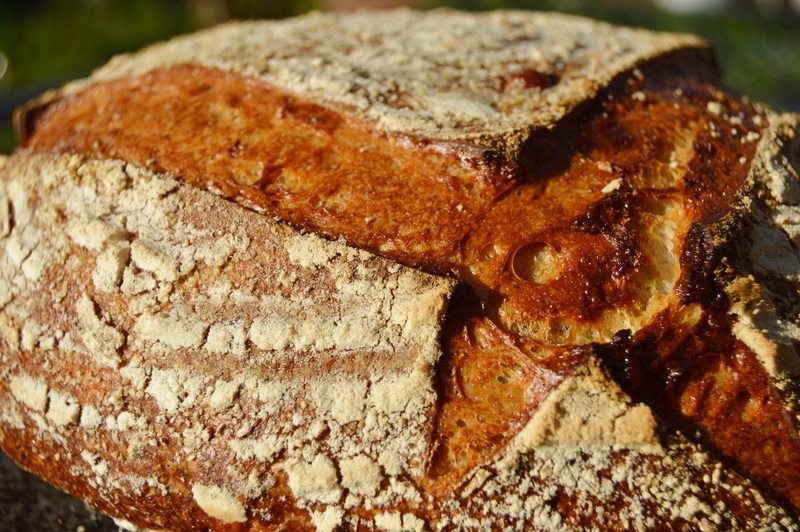 The bread works excellently with cheeses such as Parmesan, Cheddar or white crumbly cheeses such as Cheshire or Lancashire. And of course different ales work well. (1) Mix the flour, salt and cheese in a bowl. Add the starter and most of the ale, stirring everything together, adding more ale if necessary to form a soft dough. Knead for 15-20 minutes until the dough is more elastic. (2) Place in a large bowl and cover with clingfilm. Leave to prove until about double in size: my preference is leaving the dough at warmish room temperature for a few hours to help it start rising, and then transferring it in the fridge for up to 48 hours – the longer you leave it, the tangier the bread. (3) Turn out onto a lightly floured board and knead lightly. Shape into a boule and place in a well-floured banneton, which also has a generous sprinkling of semolina and/or rice flour: this is for extra insurance so the the dough will turn out easily without sticking after its second proving. (4) Dust the dough’s surface with flour and cover loosely with clingfilm. Leave to prove until the dough has well risen. Don’t over-prove: the dough should still feel fairly firm with a bit of bounce when you gently prod it; it shouldn’t feel too delicate as if it is about to collapse! (5) Preheat the oven to its highest setting and place a solid roasting tin on the bottom and a solid baking sheet on the top shelf. (6) Turn the dough onto the hot baking sheet and score with a razor: just a few determined slashes, not going too deep. Place in the oven and pour some cold water into the roasting tin to create a good amount of steam and close the door. Bake for 10 minutes at this setting before turning the oven down to 220C(fan). Continue to bake for a further 40 minutes or so: the bread should have a deep golden brown colour and sound very hollow underneath. (7) Transfer to a wire rack and cool fully before slicing and eating. I have to say I’m pretty excited to try it now! Looks wonderful. I’m looking forward to trying it with our Canadian ales/sharp cheddars. I’m curious as to what extent the still living yeasts in the ale influence and interact with the bread yeasts. I’m also wondering what the final hydration works out to be. Thank you. Yes it would taste great with other ales and cheeses. The final hydration is between 68% and 78%. In my first one, I went for a slightly lower hydration but I have made it even higher hydration: mind you, I prefer a less open crumb for such full-flavoured loaves. Just made this with Bass ale and Parmesan. Too hot to cut but fragrance is incredible. Can’t wait to try it!! hi, I hope you enjoyed it. I have to say, it is a bread I make so often!